Please contact the owner directly @ 804-357-3818 or talleymat(at)gmail(dot)com. 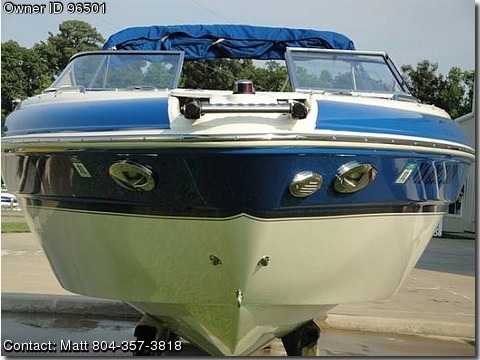 ****New Boat at Used Boat Price****PRISTINE****Only 38 HOURS on this '07, 25' Royal Blue/White open bow (walk through) 350 MerCruiser, 300hp, twin s/s props which plane boat quickly. SPEED AND ALL THE COMFORTS!! Drafts well in shallow water. Clarion marine am/fm/cd/sirius/aux w/controls at helm and swim deck, VHF marine radio, full instrumentation, LCD depth w/alarm, halogen docking lights, port side "cabin" w/"Sanipottie" (never used) with generous storage. Storage under 3 bow seats & 3 stern seats, large center ski locker, portable dining table, sun pad w/walk through to aft swim deck, 2 "cooler" type storage areas under each end of sun pad. Rear seats convert into 1 large sun/sleep pad. Bimini top w/boot. 2 bucket swivel seats at helm, snap in carpet. Ski/tow ring. 2 telescope ladders bow/swim deck. 2007 25' EZ Loader Trailer(used twice), NADA price $3330.00–FREE, to purchaser of this boat. If you would like a new family boat, but at a used boat price, please call or text me for more info/pics, arrange to view boat.